With advancing years, time seems to whip past ever quicker and I often find myself thinking “Where has that time gone?” Looking back on 2015 I feel it just flashed past without me having a chance to actually do anything. But on reflection, while Oze eluded me, I did actually manage to get out on some decent hikes during the year. Some of the trails tackled last year included the Hatsonosu gorge, Takamizuyama, Kawanoriyama, Okunoin and Nabewariyama. 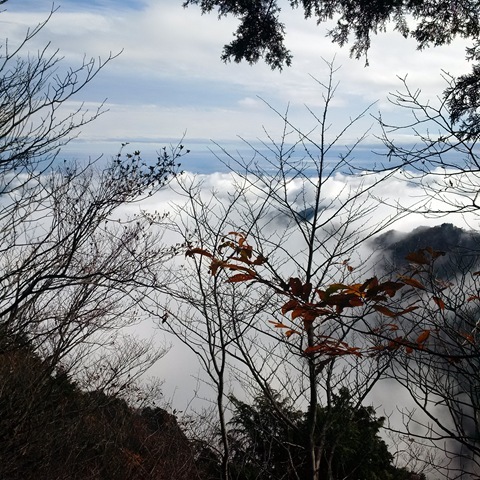 But saving the best for last, I concluded the year by hitting the three famous mountains of Okutama – Odakesan, Mitohsan and Gozenyama, the latter being completed as my first hike of 2016, last weekend. The Okutama area is a mountainous region on the edge of the Tokyo metropolitan area, and is a popular recreational destination for all kinds of outdoor pursuits. Compared to the somewhat genteel woodland trails around Takao san, the mountains of Okutama feel a good deal more rugged and challenging. Many of the mountains around Okutama were “off limits” to the locals during the Edo period, and so retain their native beech tree woodland rather than the ubiquitous Japanese cedar which carpets much of the country now. As well as creating vivid displays of colour through the changing seasons, the beech groves create a totally differing hiking environment – as we shall see in later adventures. 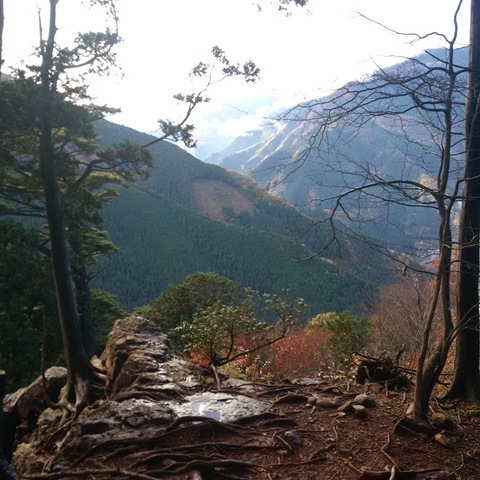 My attempt on the three peaks began with a return to Mt Odake in mid-November. It’s not the first time I have hiked this trail. But this time, rather than returning via the same route, I continued on northward to Okutama town via the Nokogiri ridge. At around 16km, it was the longest of the three hikes but the one involving the least elevation gain. The weather had not been kind in the days before my excursion, with heavy rain almost putting-paid to my plans. Even though light rain was forecast, I decided to chance it. Travelling by Ome line train to Mitake, I followed the hordes and took the cable car to Mitake village. It is possible to walk from the cable car station to the village, but it’s a fairly uninspiring relentless 4km slog up a paved road that adds very little in the way of enjoyment, so I didn’t feel bad about cheating. As the cable car climbed through the steeply wooded hillside, we passed through banks of misty low cloud clinging to the trees and I began to wonder whether I would be hiking in fog all day. But when I arrived at the top, I saw that I was now above the cloud base and was granted a sneak preview of some of the spectacular views to come later in the day. By virtue of its cable car, the picturesque village of Mitake, with its ancient temples, is a popular tourist attraction. However once you hit the trail out of town, the crowds soon disappear and you find yourself in relative peace as you head towards Mt Odake. The cable car deposits you at about 800m elevation and you gain only 100m or so over the next 2.5km of well-maintained trail, so it’s easy walking. After passing a shelter and crossing a stream, the trail gets a little tougher and progressively more rugged. As the trail climbs towards the disused mountain refuge hut below the summit of Mt Odake, it crosses several rocky outcrops where chains have been anchored into the rock to assist hikers to cross in safety. There isn’t much danger of a long fall, but a slip could prove nasty so some care is needed. Threading my way over and around these rocky outcrops, I found myself once again back in the clouds. With the direct sunlight being diffused by the cloud, the reflected light from the valley below created a weird “uplight” effect that really gave a magical, Tolkien-esque feeling to the surrounding woodland. But pushing on, I once again climbed through the mist and was rewarded with some pretty spectacular views. 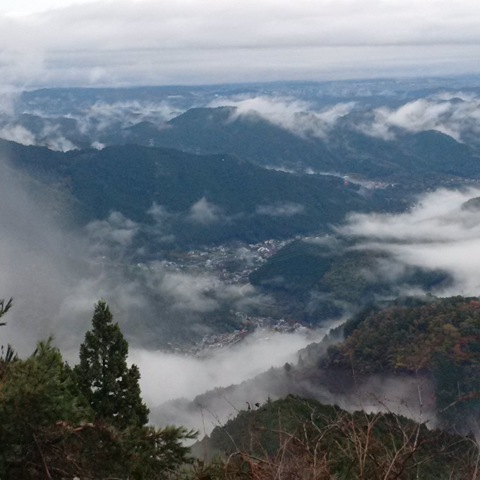 The Japanese have a word for this – Unkai – which means “Sea of clouds”. 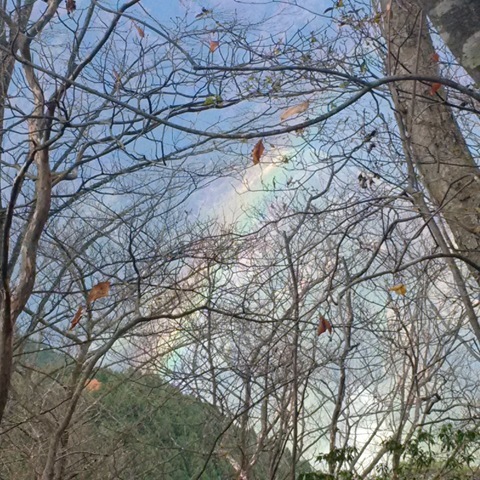 The final climb to the summit of Mt Odake begins at a disused mountain hut and threads its way past a dilapidated jinja (shrine) before rising steeply up. The muddy trail gives way to a hands-and-feet rocky scramble up the final 20m of ascent before popping out at the summit. On a good day, you can get great views of Mt Fuji from the summit of Mt Odake. But today I had to be content with looking out over a sea of cloud, with the heads of nearby mountains poking through like so many islands in a ghostly white sea. But with many km still to tackle, I didn’t have long to admire the view. Pushing on past the summit, the trail makes a steep and rocky descent down to the Nokogiri ridge 100m below, requiring some care in places. But once on the ridge heading north, it’s plain sailing through some wonderful mixed woodland. The Autumn colours had pretty much faded by the time I passed through, but I am sure this section would be nothing short of spectacular at Autumn’s peak or in the Spring. The next challenging section is as you approach the peak of Nokogiriyama, where there is another rocky scramble to the summit. I stopped for lunch here, being joined shortly afterwards by a gang of trail runners about 10 strong. Some people don’t enjoy seeing others while hiking. But for us solo hikers, I always feel better knowing that there are other people out in the woods helping to keep the bears away and to be a source of help in the event of an accident. As mentioned at the outset, Okutama is a step-up the scale when it comes to recreational hiking. Accidents, although rare, do happen. In 2015, there were 53 emergency evacuations required and 2 fatalities. The trail after Nokogiriyama becomes noticeably more rugged, with rocky sections becoming more frequent and more challenging. There are several chained sections and one or two laddered sections requiring care when wet. As you work your way down towards Okutama, it feels like you must be getting close to the bottom. But then you hit a break in the trees and you see that you are still hundreds of metres above the valley below. The views are amazing as you follow the ridge down towards Okutama. In some places, like the one shown here, the trail juts out over some quite precipitous drops, but somehow never feels particularly scary. Well, apart from one section where the path leads you across the top of a quite slippery outcrop with a very, very steep cliff on your left and very little to grab hold of if you were unfortunate enough to slip. But apart from these brief punctuations of excitement, the trail works its way downhill, varying between rocky gullies, switchbacks and slippy-slidey muddy chutes that threaten to unceremoniously stick you on your backside with every step. After about 100m of blessed tarmac, the trail heads up again to meet the Atagoya jinja, perched on top of a rocky knoll. After coming all this way, I decided it would be rude not to pay my respects so I dutifully slogged up the rocky steps. Past the jinja, the trail once again turns to endless switchbacks that test the patience, before finally emerging at the top of the longest flight of steps I have ever seen in my life – 200 according to the Lonely Planet guide. I whispered a silent thank you that I was coming down rather than going up! Before too long, the steps finish and the path meanders gently down to join the road just as it passes over the Tama Gawa river into Okutama. All in all, it turned out to be a great day’s hiking and I was glad that I’d risked the rain to tackle a trail that offers an excellent mix of scenery, some spectacular views and enough challenges to keep you focused. I think this trail could be tackled just as well in reverse, from Okutama to Mitake, which would mean a tougher climb to start with but a much easier end. As stated, some sections are a little bit steep and definitely more challenging than the easier hikes around Mitake, so care is needed and you need to ensure you are properly equipped and have adequate supplies of water and energy. One last tip – always, always always check the Okutama Visitor Centre website for notices of trail hazards, closures and detours. These ridge trails are long with very few opportunities to detour or descend in the event of a closure or other hazard, so it pays to do your homework. Next up: Mt Mito – the second peak of the three famous peaks of Okutama.